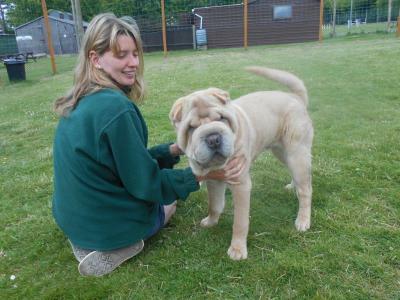 When Benny was brought to us by the dog warden last week, we had no way of knowing just how much he was suffering with various health conditions caused largely because of his breed. Benny’s problems mean that he is almost blind and his quality of life has been seriously compromised. He URGENTLY needs two or three operations if he has any hope of living a normal, pain free life in future. 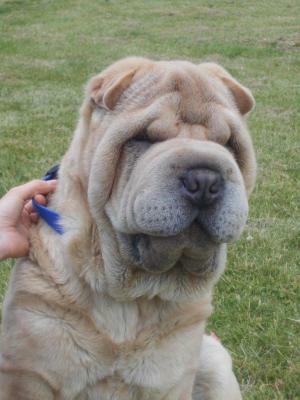 At just seven months old, Benny is suffering severely from a number of problems often associated with Sharpei’s due to the way that these dogs are bred. Benny requires surgery to cut away and remove a lot of the excess skin on his face and head. Due to the amount of excess skin on his face, skin folds are covering his eyes leaving him feeling very uncomfortable and unable to see. In addition, Benny is also suffering with a Double Entropion, a condition where his eyelids fold inwards causing irritation as his eyelashes rub against his eyes. This is so severe in Benny’s case that one eye has developed a possible ulcer. As well as his eyes, Benny’s ears are also affected and both have severe infections which have resulted in the narrowing of the ear canals. In order to make Benny comfortable, he needs a double ear ablation operation to open up his ear canals and allow the area to breathe. As if these problems were not enough, Benny also has very narrow nostrils which make it difficult for him to breathe. We need to widen these under anaesthetic and consider trimming his soft palette to help ease his breathing as well. Benny is an extremely friendly and cuddly dog but it is so difficult for us to watch him suffer. In total he will need two or possibly three big operations ­ the cost of which could exceed £1,500. Not undertaking these operations is just not an option - without these procedures, Benny’s health and welfare would be seriously compromised. We urgently need your help to make Benny better. Please consider making a donation towards Benny’s operations as every penny will count. No puppy deserves to feel as poorly as Benny, or to loose almost all their sight and hearing, and we are in a race against time to raise the funds for Benny’s operation. If you can help by donating any amount, however large or small, please visit www.justgiving.com/BennyAppeal or call 01929 471340. You can also send a donation by text ­ text MBEN50 followed by the amount you wish to donate, to 70070. For example text MBEN50 £3 to 70070 to donate £3 to Benny’s Appeal. Thank you from Benny, and all of us working to save his quality of life, from the bottom of our hearts.